On this date in 1968, Rhodesia earned global opprobrium with a triple hanging in Salisbury (today known as Harare). Labour M.P. 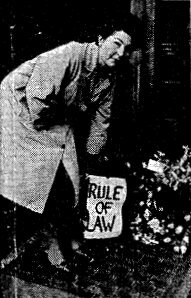 Anne Kerr lays a wreath at the Rhodesian embassy to protest this date’s hangings. A few months later, Kerr would be the one in the world’s headlines … when she was roughed up by Chicago police at the 1968 Democratic Convention. This was the first “Rhodesian” execution, three years on into the white-supremacist (pdf) breakaway state — which had bucked orderly majority-rule decolonization by declaring independence under its settler government. So it was hardly a matter of whether James Dhlamini, Victor Mlambo and Duly Shadrack were or were not “guilty”: springing the trap on the gallows was an act fraught with racial hostility within Rhodesia (today, Zimbabwe) and throughout a decolonizing world. Queen Elizabeth II issued a royal reprieve and the British government warned of the “gravest personal responsibility” attaching to anyone who involved himself in the proposed hanging. Rhodesia royally ignored it. I have been hanging people for years, but I have never had all this fuss before. There were even demands for humanitarian intervention — amounting to a British military occupation — to protect the other hundred-plus blacks then awaiting the gallows. Needless to say, that wasn’t about to happen, so in the face of Salisbury’s intransigence, was it all just sound and fury? Does the Secretary of State recall that it was Winston Churchill who said: “Grass grows quickly over the battlefield; over the scaffold, never.”? Rhodesia insisted on the point by hanging two more Africans five days afterwards … but it also announced 35 reprieves. In its fifteen years, Rhodesia never did get itself clear of the fuss over white rule; it remained a global pariah and eventually succumbed to its long-running Bush War.